A new “friendship bench” intended to encourage discussion of mental health will be unveiled April 7 at the University of Guelph. 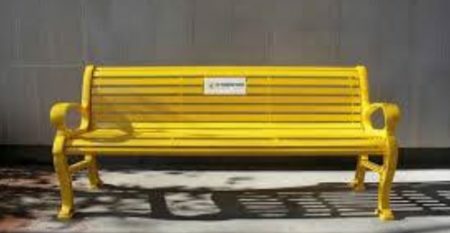 The bright yellow bench will be located near Branion Plaza for community members to unwind and discuss their own mental health and that of others. The bench contains a URL for campus and provincial resources, and services for mental health and suicide prevention. It will be a visual reminder of the importance of discussing mental health in the U of G community and the need to reduce mental health stigma, said Brenda Whiteside, associate vice-president (student affairs). “The idea was brought to me by a student, and I felt it was an exciting idea,” she said. The structure will be unveiled in a ceremony involving Sam Fiorella, managing director of the Lucas Fiorella Friendship Bench, a non-profit supplier of the benches. With suicide now the second-leading cause of death among Canadians between the ages of 15 to 34, developing a “culture of openness” around student mental health has never been more important, he said. The organization’s #YellowIsForHello program is designed to help schools foster an environment that enables students to talk and learn about mental health. Fiorella said the program aims to increase awareness of mental health issues, alleviate possible feelings of shame or weakness, and encourage more students to seek help. “We’re delighted the University of Guelph has stepped forward to launch the #YellowIsForHello program and place a friendship bench on its campus,” he said.